Are you sleeping on his feathers? Or, are you wearing his feathers in your jacket, etc.? 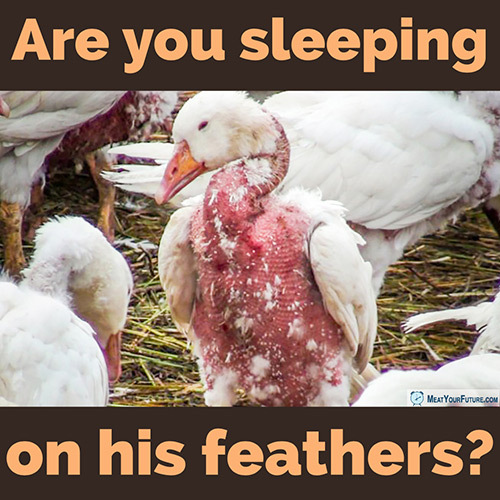 It can be shocking to realize that the blanket, pillow, or jacket you purchased in a nice store came from animals who needed his or her feathers (or fur or skin) to live. In the case of “down”, it comes from animals like this who are barely kept alive and have their feathers plucked from them, with many having to endure that agony over and over if they survive each plucking. Their existence is filled with fear, confusion and pain. And, of course, if they are not slaughtered before plucking, they are slaughtered just as soon as they are no longer profitably “producing” enough feathers. But that’s what happens whenever we commoditize any sentient being, whether for their feathers, skin, wool or for food. We take a vulnerable animal, and we impose violence, fear, pain and death on them. And, for what? Do we “need” a down pillow? Of course not. So, please do not buy “down” products (or leather, or fur, or wool, or any other animal-based fabric). But please also keep in mind that the vast majority of suffering and death we impose on animals in the world is for food. So while you may not use fur, down or leather, if you’re still consuming milk, eggs, meat and other animal foods, then you are still paying for someone to impose needless harm and death on vulnerable animals on your behalf. Please do not support any of this unnecessary violence against animals. Please go vegan. If you believe animals matter at all, then it’s the least we can do.